You can display facebook livestreamed videos on your Screens with piSignage. In fact you can play any facebook video by uploading the video url as an asset.In this writeup you will learn in detail the steps involved. 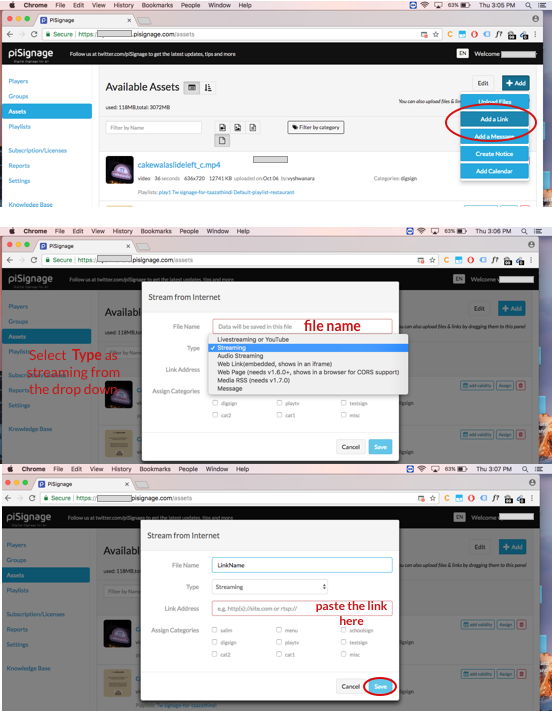 The steps explained below are applicable both for displaying direct livestreams and uploaded videos. Find the video in facebook(livestream or uploaded). Right click on the video click Show video URL ,Copy the URL that is displayed and paste it in a new TAB. Edit this URL by changing www. to an m. making the video mobile version. ( eg www.abc.com/xyz to m.abc.com/xyz) and press ENTER. Play the video. On right click select the option "copy video address"
Under pisignage.com/assets, add link and select type as "Streaming" and paste the url you just copied. (for both uploaded and facebook livestreaming videos use type "Streaming" from the dropdown menu, there is a type called "Livestreaming or YouTube" - which is not used here in case of facebook). Now you can add this asset as a part of any playlist. The quality of the output depends on the quality of the uploaded video/livestream.